At Biggio Dental Care as part of our commitment to providing patients with superior dental care, we use digital radiography (x-rays) to detect decay and disease earlier than would be possible with a basic oral exam. You will most likely receive an x-ray as a new patient, if you have signs or a history of disease or decay, or if your teeth are touching, which makes it impossible to see all surfaces. Digital x-rays are quickly taking the place of traditional film-based x-rays and have become one of the most important advances in dental technology today, offering our patients substantial benefits. A small sensor is placed inside your mouth, instead of the traditional paper tabs that fit awkwardly and often cause pain. The sensor is connected to a computer by a thin, unobtrusive wire and records a highly detailed image of your mouth. 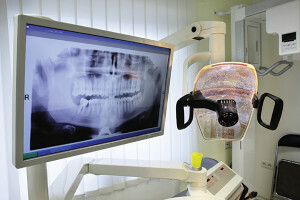 The image is then sent to the computer, where it is instantly projected onto a screen for the dentist to review. Call 225-767-4491 to schedule an appointment with your Baton Rouge, LA dentist today!